Yesterday’s Kid is Back with More Memories of Thurmont Ask Dr. Lo – Why Can’t I Lose Weight? Have you recently fallen in love? Are you newly engaged and planning a wedding? Did you recently get married? If so, Mount Saint Mary’s graduate and author Stephanie Calis has some practical and spiritual advice for you. 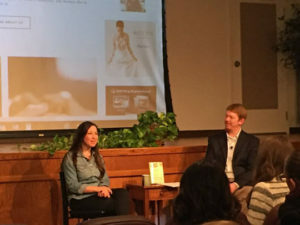 On February 11, in honor of St. Valentine’s Day and the observances of National Marriage Week (February 7-14) and World Marriage Day (February 11), the Seton Shrine hosted a “Chat with an Author,” featuring Calis and her book, Invited: The Ultimate Catholic Wedding Planner, which is up for its second printing and has been a #1 Amazon bestseller in Weddings. Saint Elizabeth Ann Seton was the first native-born U.S. saint. Because Mother Seton was a young wife, mother, and resident of Emmitsburg, the Seton Shrine was thrilled to invite Calis to share her message with the community. The event, which was well received, was moderated by Shrine Programs Director Tony Dilulio and included a talk, a question and answer session with the audience, a book signing, and refreshments. The free event was the second in the series, with the next talk (featuring Good Enough is Good Enough: Confessions of an Imperfect Catholic Mom, author Colleen Duggan) scheduled for 3:00 p.m. on April 29, 2018. Calis, a young wife and mother herself, was happy to meet with the community and share her wedding and marriage advice in a refreshingly humble and down-to-earth style. Her passion is sharing with others the immense worth that they hold as a human person; that love is a verb; and that pure, sacrificial love is real. With the tone of a big sister or a best friend, Calis invites her reader (much like a friend would over a cup of coffee) to see with fresh eyes the beauty and truth of the sacrament of marriage. In an honest and caring manner, Calis shares her insights in hopes to share that rules as established through the Catholic Church are in actuality freeing, resulting in pure, sacrificial love. “My hope for the book is to present a message, which is accessible and inviting, where Faith is a path to freedom,” adds Calis. In an attempt to combine practical wedding planning advice with spiritual teaching and insights, Invited includes the Catholic Rite of Marriage; planning worksheets and checklists; sample invitations and programs; and reception planning sheets, interspersed with information on marriage prep programs, how to choose the perfect dress, budget aids, planning resources, and more. Another unique element of the book is the “From the Groom” advice, which includes thoughts and insights written by her husband. While a student at the Mount, Calis met her future husband, Andrew, a fellow student in her English class. In 2010, Calis graduated, got engaged, and worked in the field. The following year, she and Andrew married at the Grotto in Emmitsburg. Over the next year, she and her husband attended nine weddings for friends and family. Each time, Calis, who had just recently planned her own wedding, was asked for practical advice on topics from the liturgy to vendors to wedding planning. After realizing there were very few resources covering both the practical and spiritual aspects of wedding planning, Calis attempted to humbly fill that void. In 2012, she started a blog, Captive the Heart, to inspire and assist new brides-to-be. Soon after, the sisters from Pauline Books and Media approached her, asking her to write a book, incorporating her insights from the blog. Calis was thrilled to do so, and in 2016, Invited was released. Those looking for helpful, friendly advice in wedding planning or marriage, can reference Calis’ book, Invited; her blog, Captive the Heart; or her current undertaking (as co-founder and editor) of the beautiful and inviting blog, Spoken Bride. Author Stephanie Calis and Moderator Tony Dilulio respond to questions from the audience at Seton Shrine Chat with an Author event.